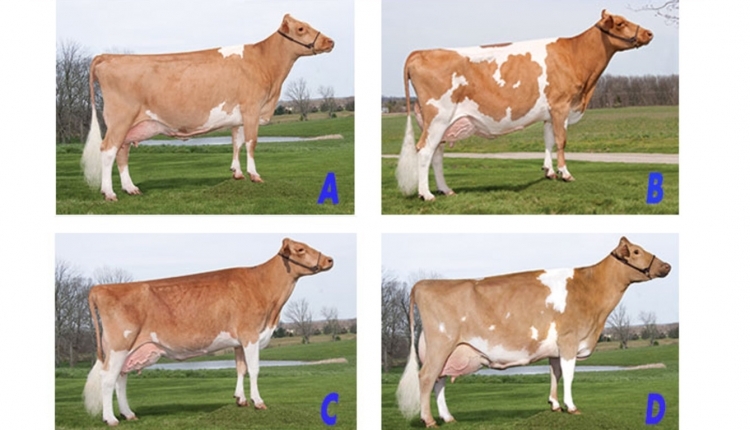 I placed this class of Ayrshire aged cows B A C D. I place B over A for her great advantage in dairyness and size and scale. 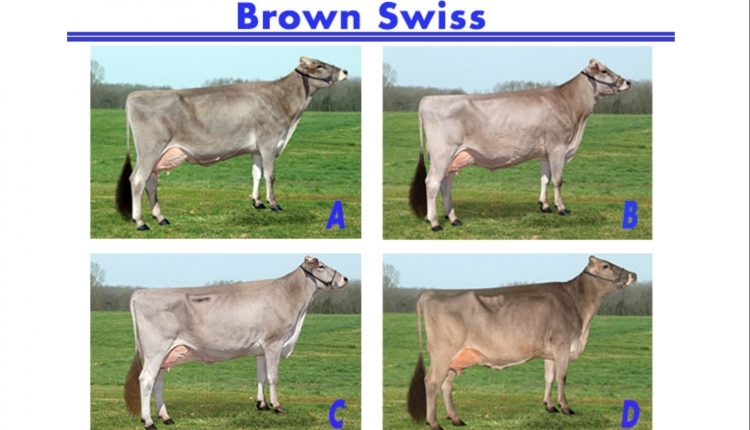 B is a taller, longer cow with more angularity over the withers, back, hooks, and pins. Furthermore, B has more depth in the heart, fore and rear rib, with more spring and openess of rib than A. B also has more width through the front end. B stands on a better set of feet and legs with less set to the hock and more depth to the heel than A. B also has a more desirable front teat placement. I grant that A is more nearly level on her udder floor and has a stonger udder cleft. In a close placing, I place A over C because of the strength of her udder attachments. 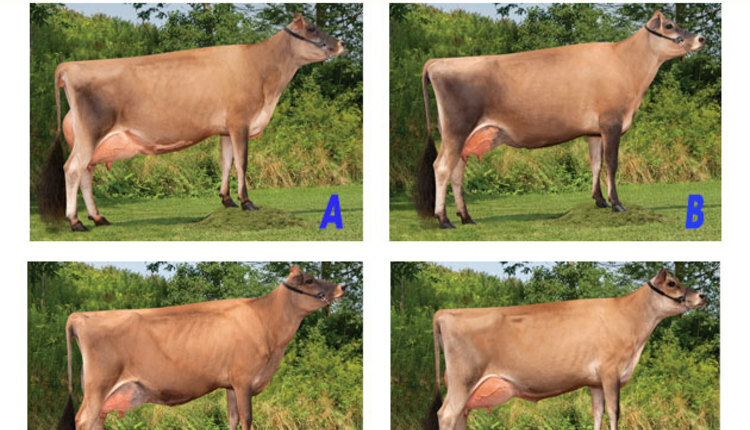 A is much stronger in her fore udder attachment and has a higher, wider rear udder attachment with a more shapely and desirable turn to her rear udder. A also exhibits a stronger median suspensory ligament than C. I give an advantage to C, however, in being a longer, leaner cow with less flesh throughout and standing on a more desirable set of feet and legs. In a logical placing, C goes over D because of her advantage in style and angularity. C is a much leaner cow in her front end and brisket and carries less flesh over the back, hooks, and pins. She is also more incurving in the thighs. C also stands on a more correct set of legs with less set in the hock and a deeper heel. C also has a more desirable teat size and placement with her udder being held higher above the hock. Although D has a higher, wider rear udder attachment, her depth of udder and lack of style and angularity prevent her from placing higher. 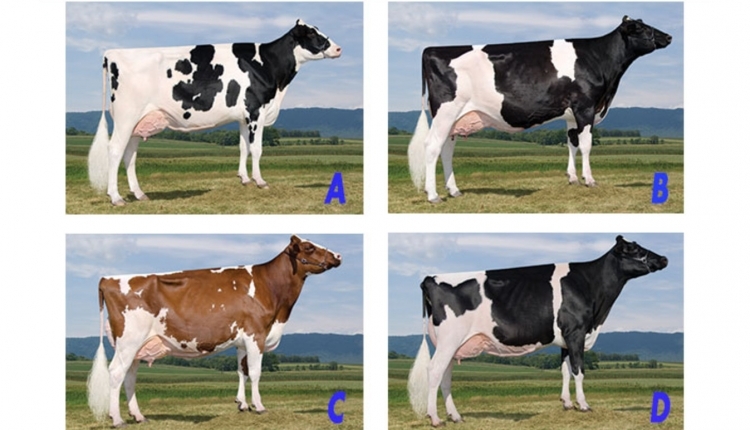 Bill Langel, McFarland, Wis., placed the Ayrshires. The Langel family has been involved with showing Ayrshires for over 70 years. 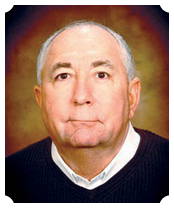 Starting with Bill's father, Nelson, and continuing through Bill and Linda's three children, Scotch Haven Ayrshires has shown numerous All Americans and grand champions at two national shows. 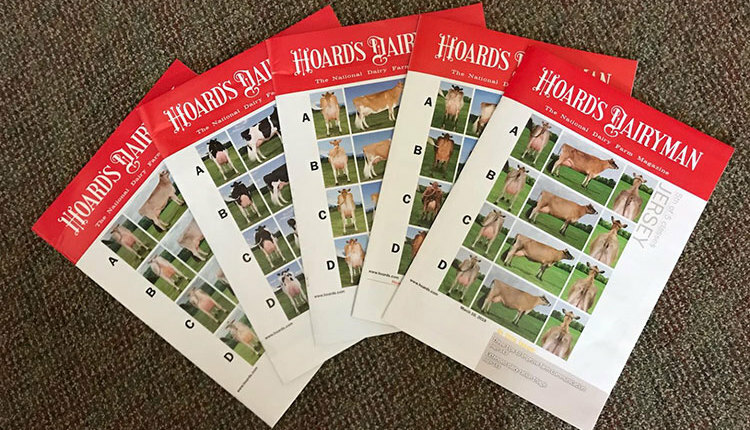 Bill has judged state, regional, and national shows, including shows at World Dairy Expo and the North American International Livestock Exposition. He was a member of the second-place team at the National Intercollegiate Dairy Cattle Judging Contest for Ohio State. A consultant for 20 years for Holstein USA, Bill is now a dairy specialist for East Central Select Sires.